As one of the most popular characters in the Star Wars universe, R2-D2 owes at least some of his fame to a forgotten droid named R5-D4. If you remember, after being sold to Uncle Owen by the Jawas it broke down with a bad motivator, allowing Artoo to steal the spotlight. It’s a tragic tale with a happy ending now that Sideshow Collectibles is releasing this nine-inch tall tribute to R5-D4. 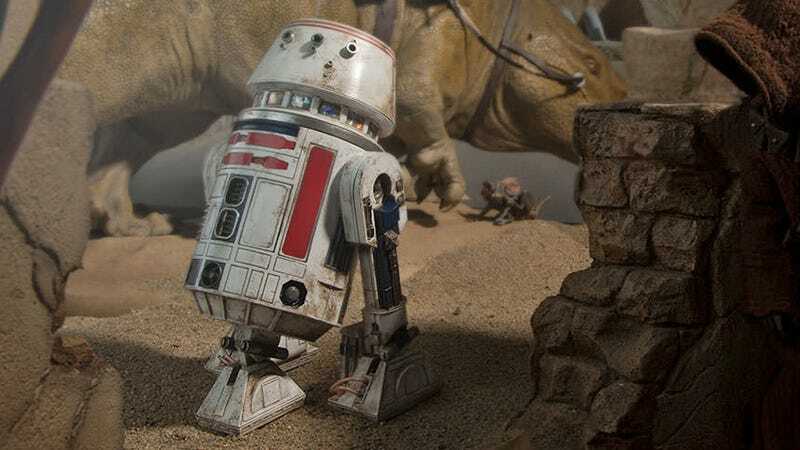 It’s impossible to know what fate befell poor R5-D4 once Uncle Owen chose R2-D2 instead. Maybe the Jawas fixed it up and found another buyer, or maybe they just turned it into scrap parts. Either way, its legacy lives on in this highly-detailed Sideshow Collectibles figure that includes a swivelling dome, articulated legs with a retractable foot, three secret body compartments, a restraining bolt, and of course a pop-up bad motivator.